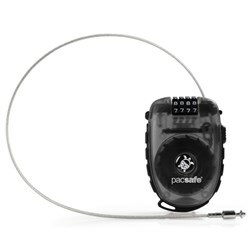 The Pacsafe Prosafe 1000 is a TSA accepted black 3-dial cable lock protects gear that can be broken rendering it useless when arriving at destination. This Travel Sentry Accepted lock is recognised by the transport security administration in all US commercial airports and HRSC officers in UK. The Prosafe 1000 features a 3 dial resettable combination, deadbolt locking mechanism and offers a built-in anti-thef option. 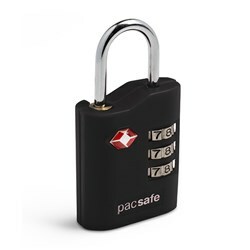 The Pacsafe Prosafe 1000 has many exciting features for users of all types. FactoryOutletStore stocks a full line of accessories like 4 Dial Retractable Cable Lock and Combination Lock for the Pacsafe Prosafe 1000. The Pacsafe Prosafe 1000 is sold as a Brand New Unopened Item.